This former artist's studio is integrated into a green setting, in total quiet in a park of 3500 m2. Glasses diffuse a light like no other. An industrial decoration and all in heat invites rest and relaxation. At home, in the countryside, very close to historical sites, walks or mountain bikes, with the small addition of the swimming pool, sauna and outdoor kitchen. Composed of 2 rooms with each room of bath and toilet privative for the floor and of a living room chimney, space of relaxation and games, kitchen with American and dining room. A terrace and a closed garden of walls of 300 m2 allow an absolute relaxation. This was an awesome place to relax and unwind after Paris. The proximity to the Normandy D-Day landing beaches was very convenient. The property itself is gorgeous with a nice garden and pool area, very quiet. The only sound was the breeze and the birds!!! The unit is roomy and comfortable with all the amenities one could need. The area is in the countryside of Normandy, with numerous small villages and gorgeous countryside. The roads and access were all good....it was an extremely enjoyable and relaxing stay. Your hosts Berenice and Richard are the epitome of French hospitality! Any and all questions were answered, they gave numerous recommendations that we followed and enjoyed every one. They are very gregarious and ensure that your stay will be everything you could want. I would give this location my highest possible recommendation. Thank You....Merci...Berenice and Richard!!! Thank you for review, we really enjoyed having you here. You're family history was really interesting with the stories regarding D-Day and we keep a fond memory of the conversations we had together. Thanks again and see you next year! Nous vous remercions chaleureusement pour ce retour, nous débutons 2019 avec cette lecture qui nous fait chaud au coeur, au plaisir de vous retrouver pour un nouveau séjour. Bérénice et Richard. Great location to explore D-day sites and Bayeux. Unit is spacious and well decorated. We enjoyed our stay in this beautiful unit. Our hosts were very nice and helpful. Everything went well except for internet access which was s bit challenging. We made beautiful meetings with you. We worked on the internet connection and she is totally fluid from now on everywhere. It is not anymore a challenge! 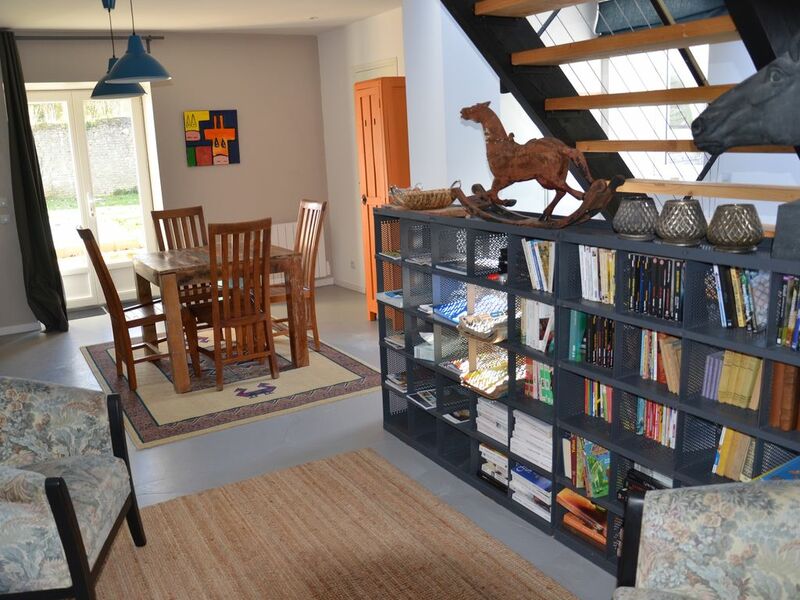 The house is very close to Arromanches les Bains and landing beaches. I propose personalized tours around us following the interests of our guests around the Middle Ages or the Second World War. Remarkable gardens are just nearby.